We are coming down to the wire of the 2019 California Spring Trials. It’s been a hectic few days, but it’s also been a lot of fun catching up with old friends while seeing new introductions. On Tuesday, we ventured out to Buellton to visit the exhibiting companies at Windmill Nursery. This year, the companies at this location included: J. Berry Nursery; 2Plant International; Skagit Horticulture; Kientzler; Dramm; Oasis Grower Solutions; and Pelemix Coir. We then made our way down to Santa Paula to visit all of the different divisions of the Ball Horticultural Co. So far, the Ball companies are leading the pack when it comes to the total numbers of new introductions. We also had the opportunity to see PanAmerican Seed’s new Beacon impatiens in person and learn how it is winning the IDM battle. Our final stops today are in Oxnard to see the companies exhibiting at GroLink and then to Santa Paula to visit with Green Fuse Botanicals and Westhoff. You can read our final report tomorrow. 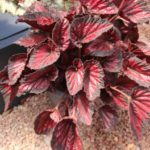 These begonias have a rich and luxurious foliage that really lights up a landscape. These rhizomatous hybrids are bred for heat and drought tolerance and show little inclination for pest and diseases. These early bloomers will grow to 6 to 18 inches tall and are hardy to Zone 8. There are four varieties in the collection. Pictured here is ‘Positively Peridot’. This variety has large flowers and wider foliage for great consumer appeal. It is genetically short and does not require any plant growth regulators. It also is more heat tolerant than other varieties. 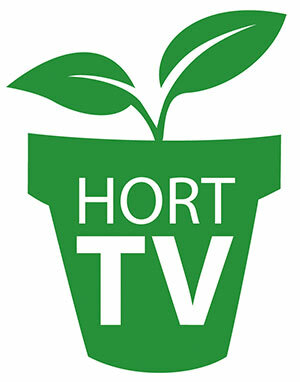 It is a versatile plant that will bloom in 64 days and will grow to about 17 inches. 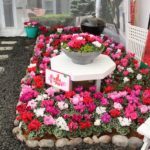 Impatiens are making a comeback at Spring Trials. 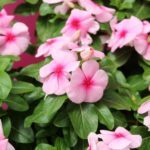 The new Beacon series exhibits high resistance to impatiens downy mildew from sowing all the way through the gardening season. It will grow 10 to 12 inches tall and 12 to 14 inches wide. The series is made up of six colors and two mixes. Violet Shades is shown here. This African daisy was inspired by the colors of Zion National Park in Utah. It has large, vibrant-colored flowers that transition into a deep purple ring. ‘Zion Purple Sun’ has medium vigor with excellent branching and a full mounded habit. It is supplied as AutoStix cuttings. 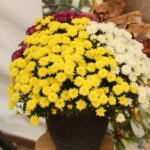 ‘Madonna’ offers better uniformity in height and habit over other leucanthemums. 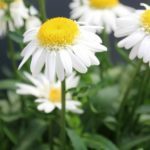 It is compact and first-year flowering and doesn’t require vernalization. Some petals have a laced edge for a unique look. Recommended for quarts up to large containers using multiple plugs. One-of-a-kind colors and strong vigor make this ideal for mixed containers. Features a vibrant bicolor with large flowers and excellent heat performance. Flowers stay open under low light conditions. Works well in 6-inch pots up to large hanging baskets. Fun snack-sized peppers are available in four different eye-catching colors — Red, Purple, Orange and Yellow. 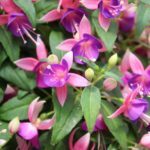 The timing and habit is similar for all four, so they can be grown together in one large container for a tasty and attractive patio display. Plant size grows to 18 to 30 inches. Fruit size is approximately 3 1/2 by 1 1/2 inches. Look out Day 5 — here we come!